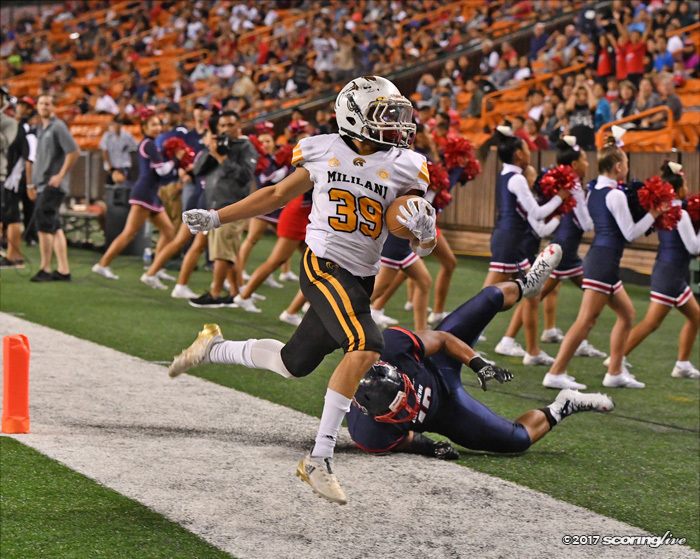 HALAWA — Mitchell Quinn owned the night. 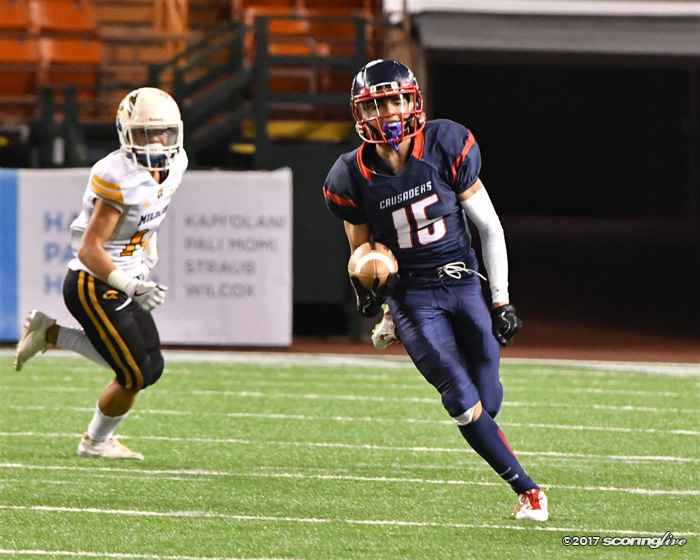 Quinn, a senior wide receiver, hauled in five touchdown passes from quarterback Chevan Cordeiro to lead No. 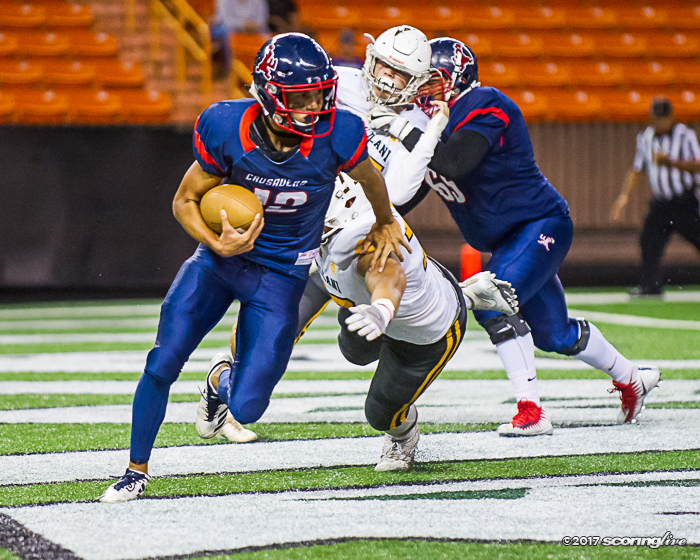 1 Saint Louis to a 47-23 win over No. 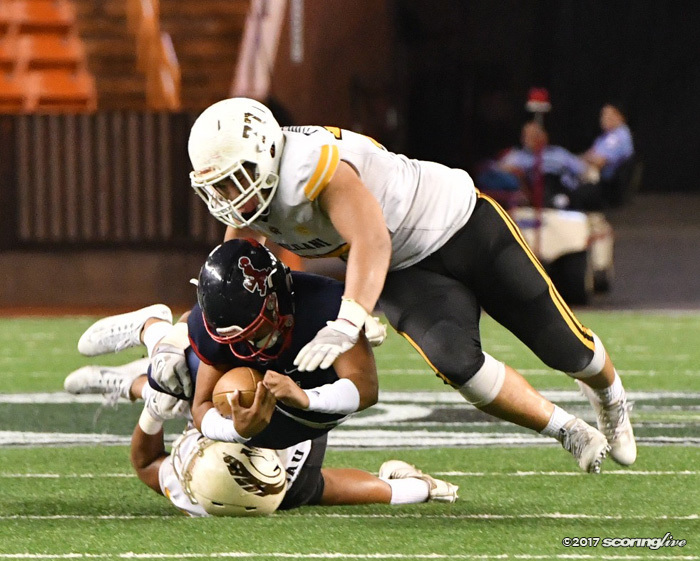 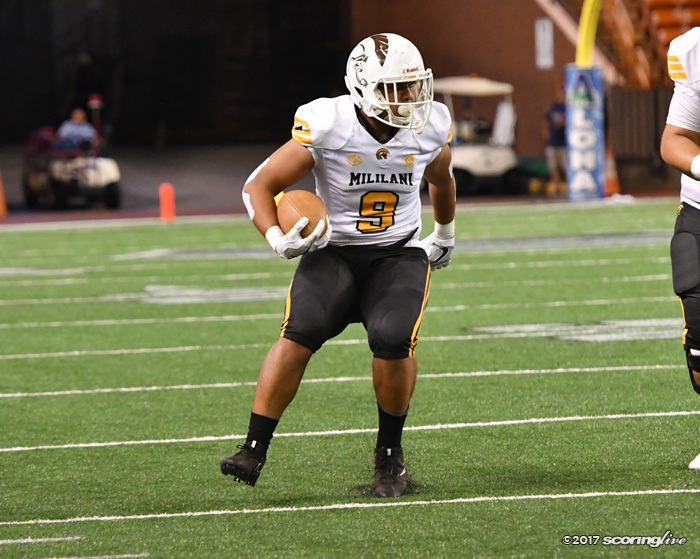 3 Mililani in the semifinals of the First Hawaiian Bank/HHSAA Division I-Open State Championships in front of an Aloha Stadium crowd of 8,673 Friday night. 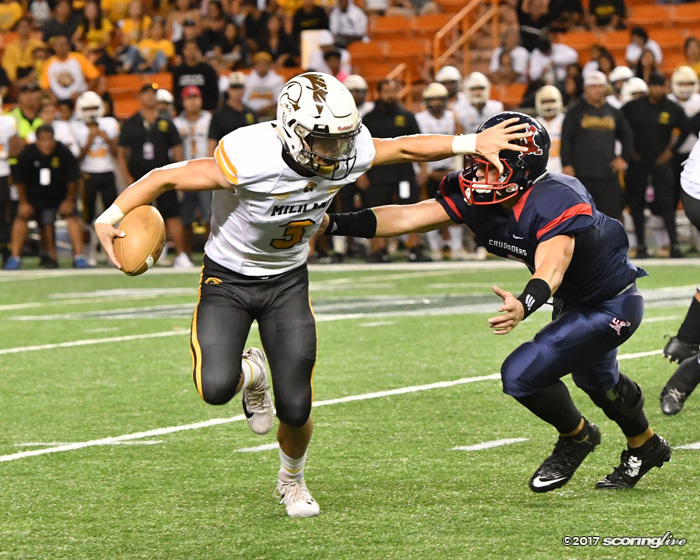 The Crusaders (9-0) scored the game's final 37 points to rally from a 13-point, second-quarter deficit to hand the Trojans (10-2) their second loss in as many weeks. 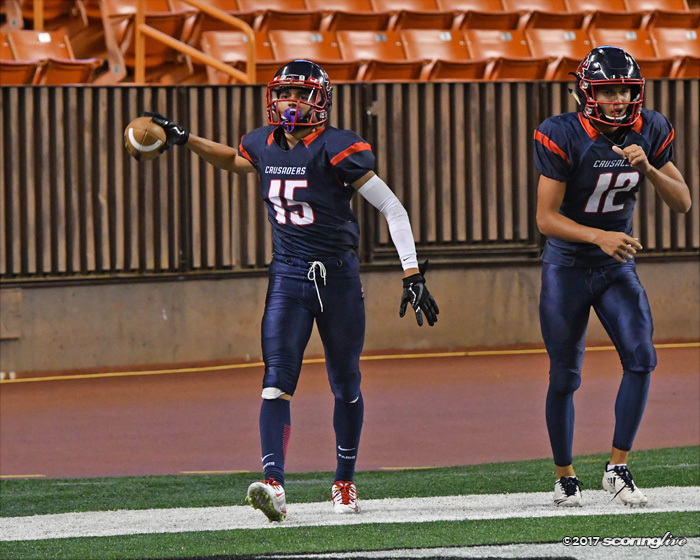 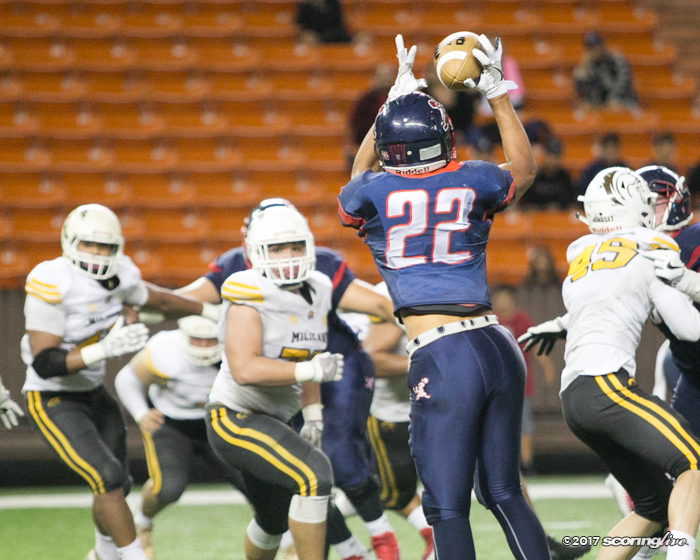 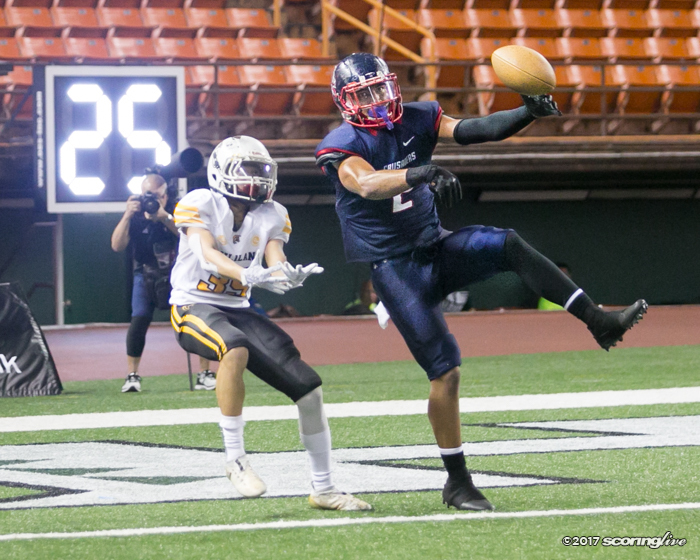 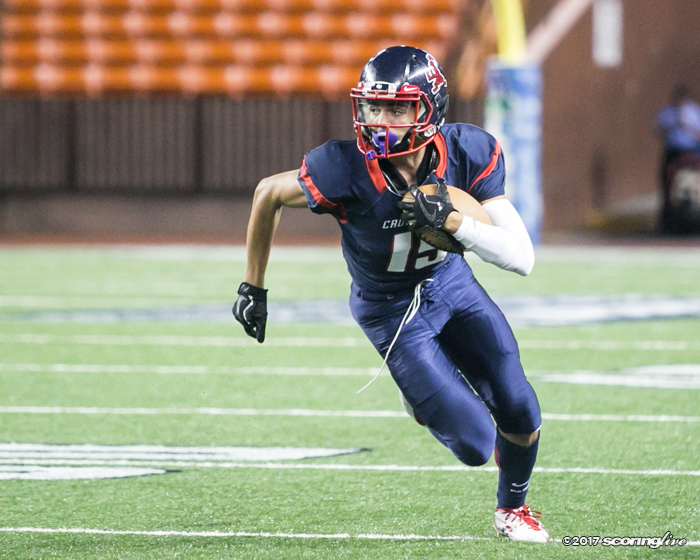 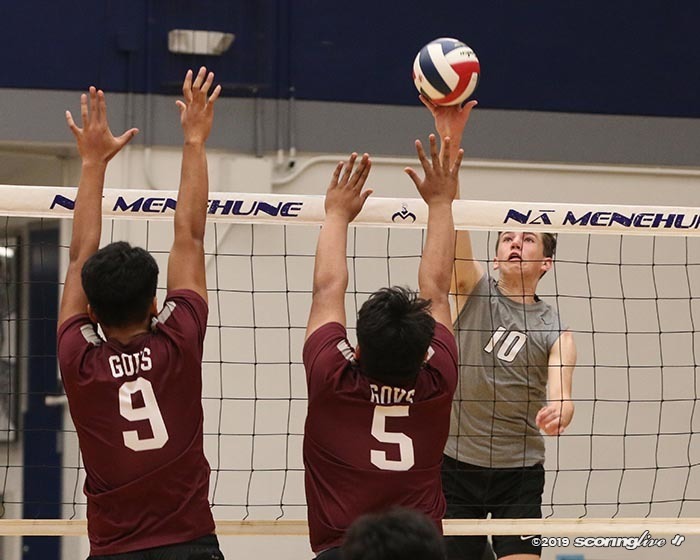 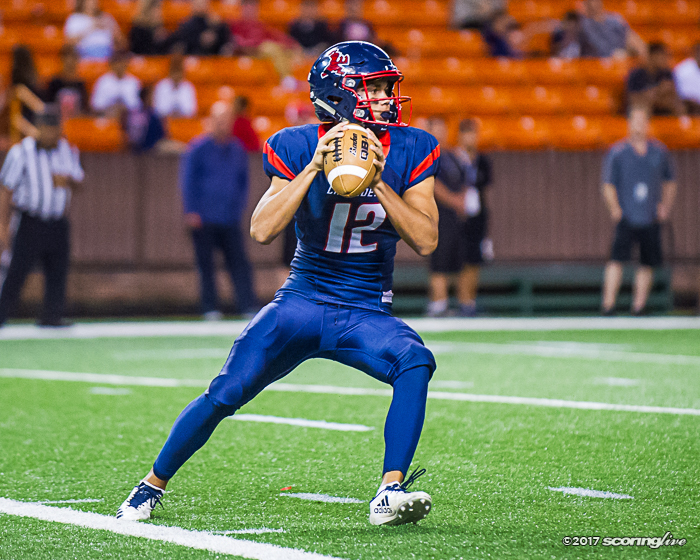 Saint Louis will face second-ranked Kahuku in next Saturday's 8 p.m. title game. 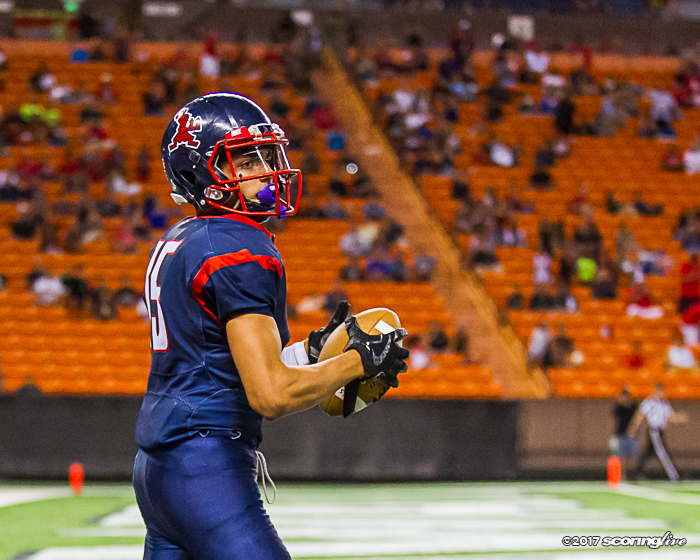 Quinn posted eight receptions for 307 yards. 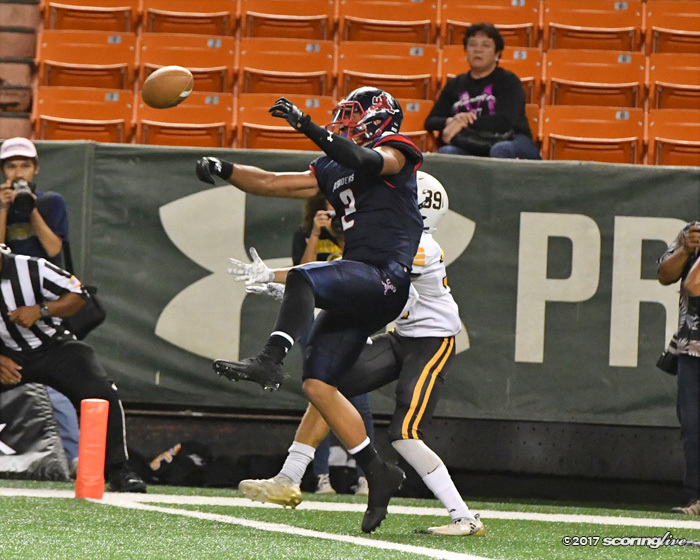 He hauled in touchdown receptions of 51, 50, 69, 57 and 59 yards and is the only player in state tournament history to record five receiving TDs in a game. 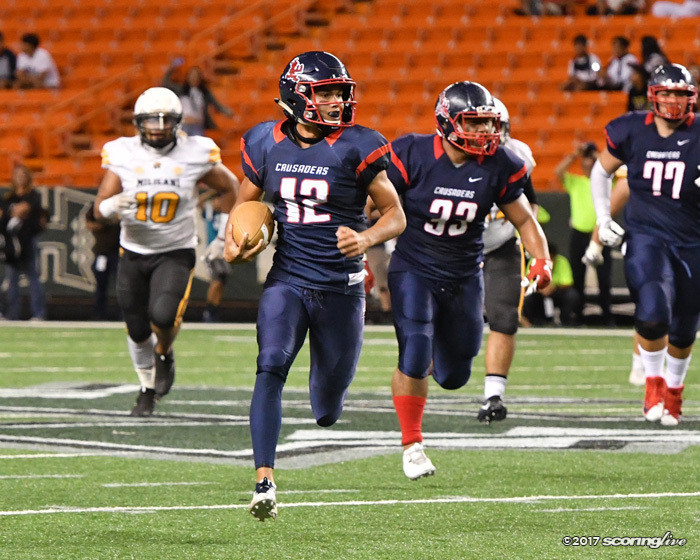 The Crusaders, who trailed for the first time against a team from Hawaii this season, finished with 649 yards of total offense. 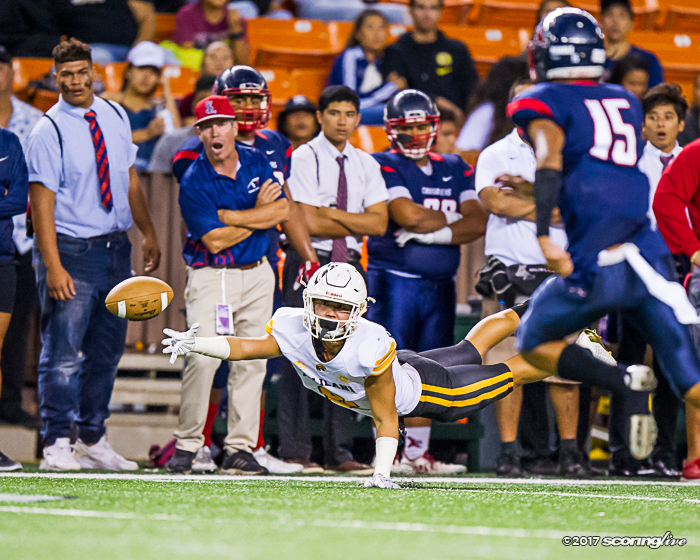 "The offense, I gotta give them a lot of credit. 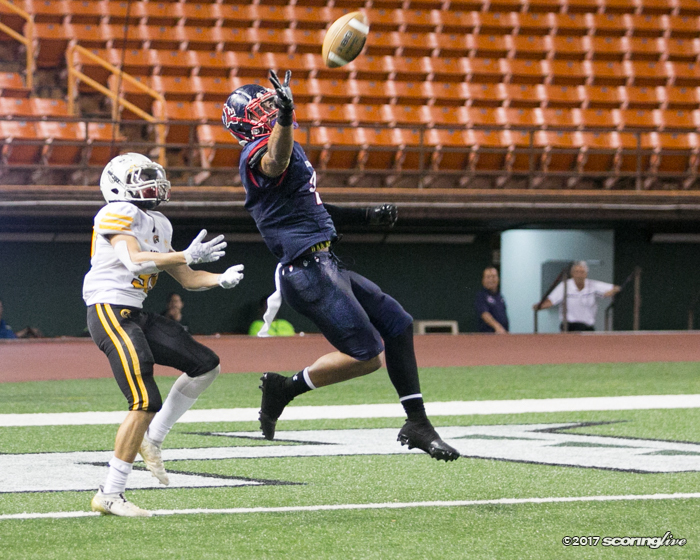 I mean, what they did — they caught the ball, made some great plays — I'm real proud of them," Saint Louis coach Cal Lee said. 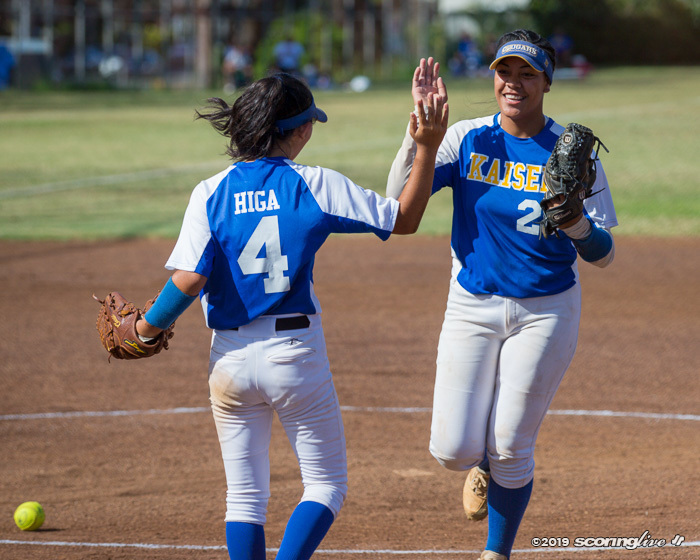 "Not only the players, but the coaches who worked hard to get us where we are now. 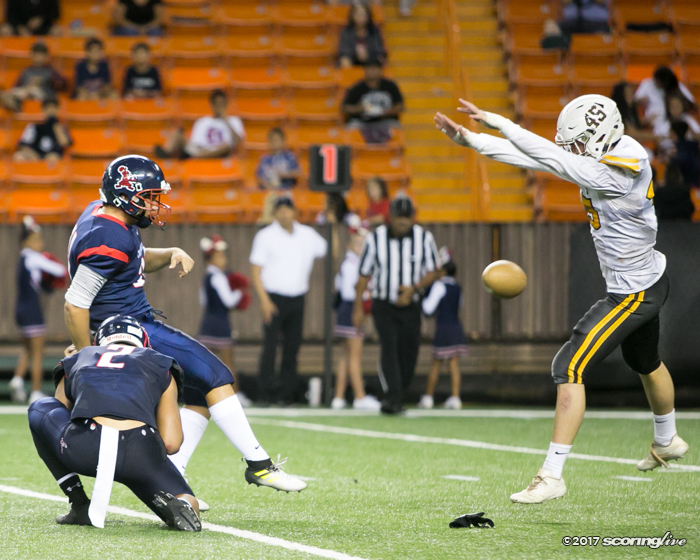 I mean, I'm real proud of them." 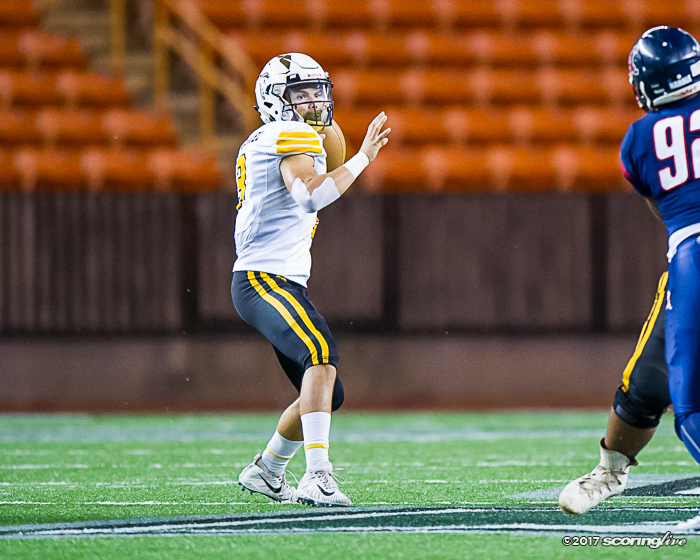 Cordeiro threw for a state-tournament record 528 yards on 24-of-29 passing and was not intercepted. 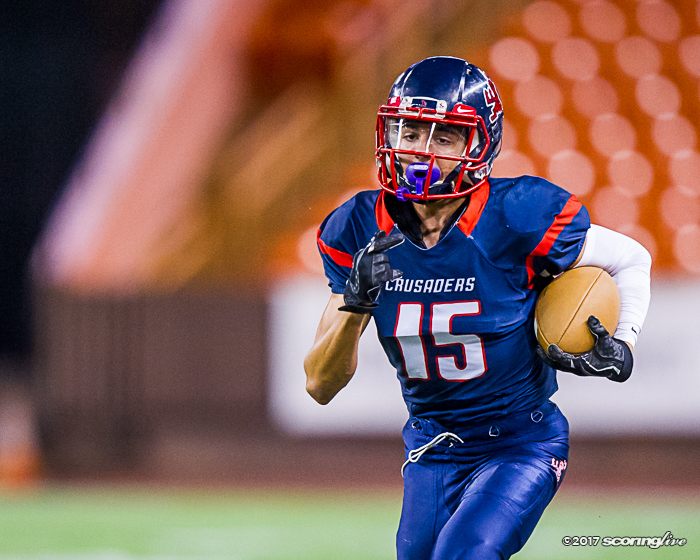 He also rushed for 104 yards on 17 carries, including his 10-yard TD run that spurred the Crusaders' comeback. 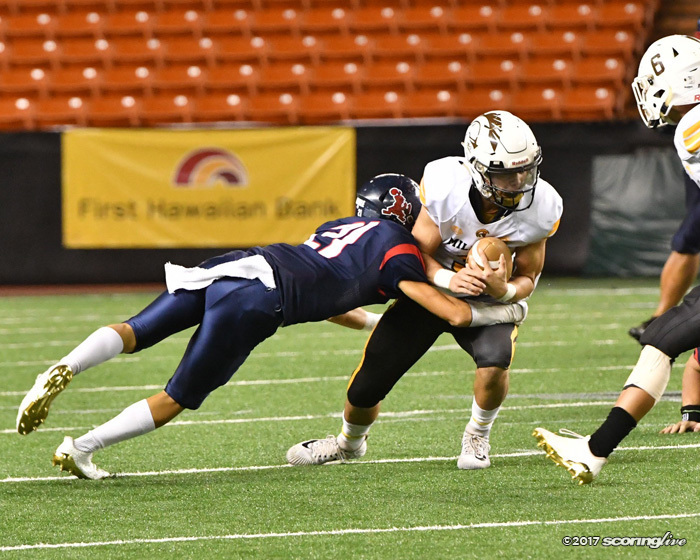 "I always believe that offense wins games, but defense wins championships, so it's kind of like putting the pressure on," Lee said. 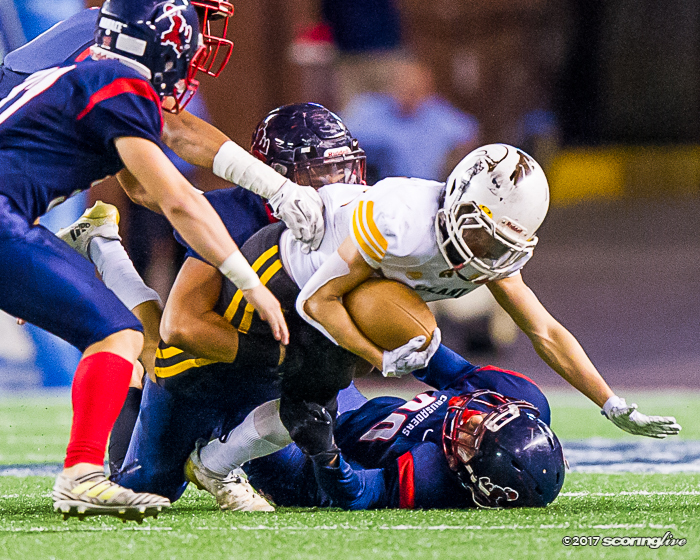 "If they don't score, we win." 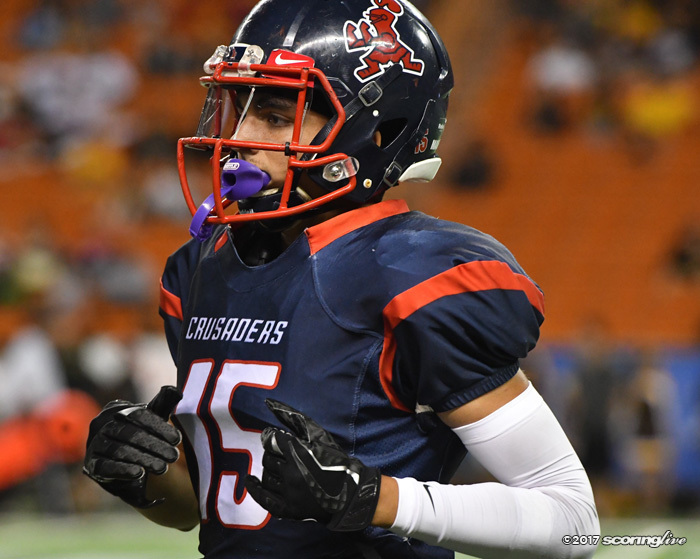 That's exactly the formula the Crusaders followed, pitching a second-half shutout after trailing 23-17 at halftime. 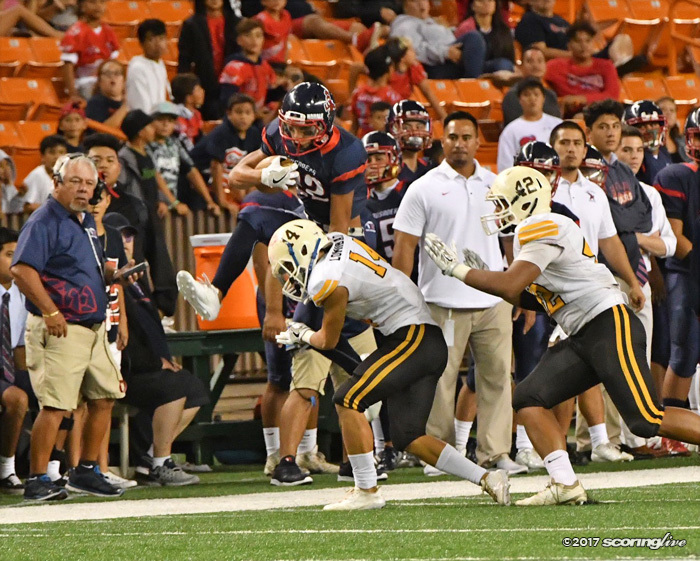 Mililani held a 23-10 lead following Dillon Gabriel's 25-yard scoring strike to Reichel Vegas with 3:49 left in the first half, but the second half belonged to Saint Louis. 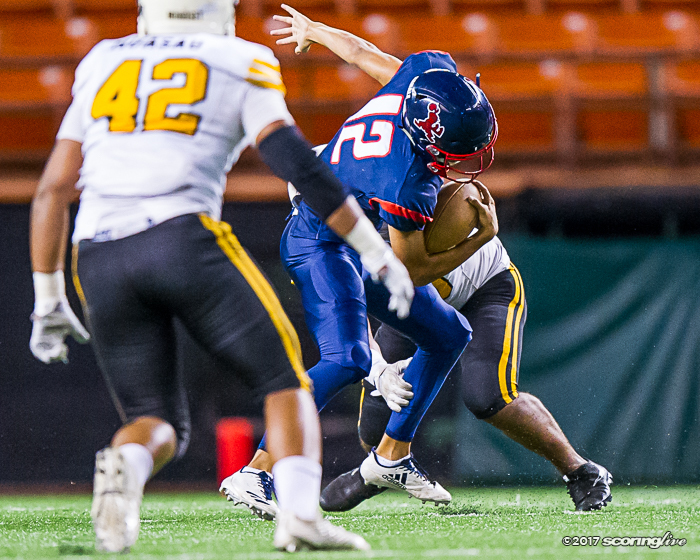 "I just think defensively we played a little better and it's all about raising the level of effort out there," Lee said. 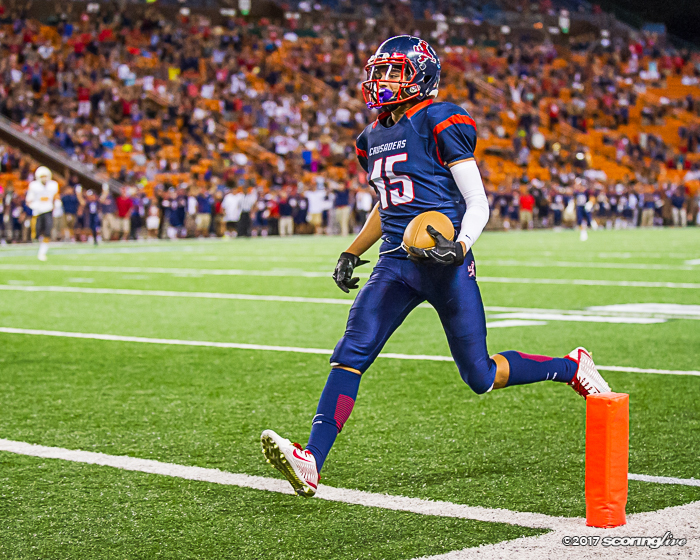 "I told them, ‘Hey, this is it. 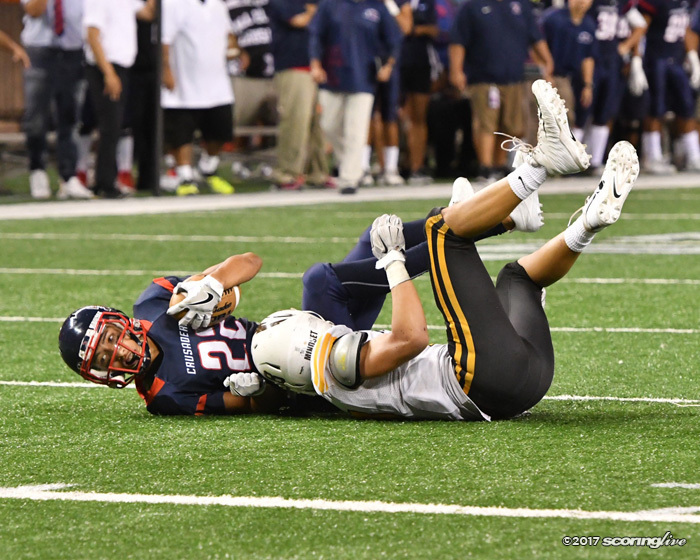 There's no tomorrow. 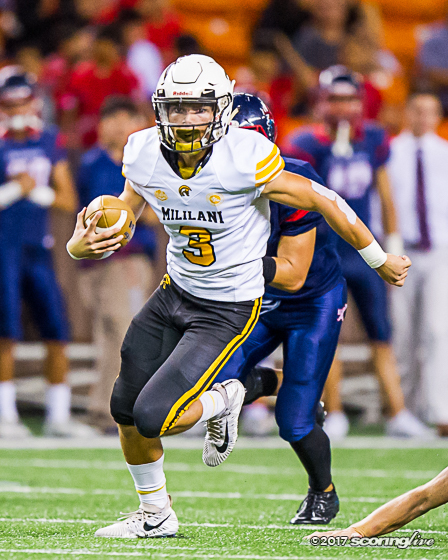 It doesn't matter. 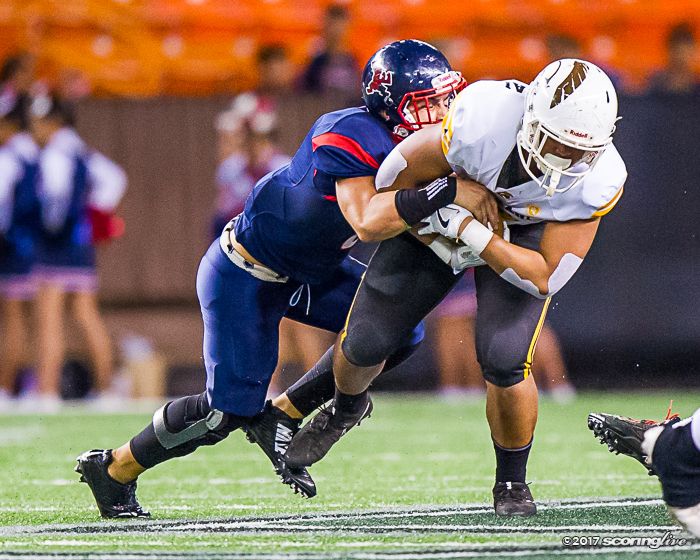 The game is four quarters, we played two, we got two more left. 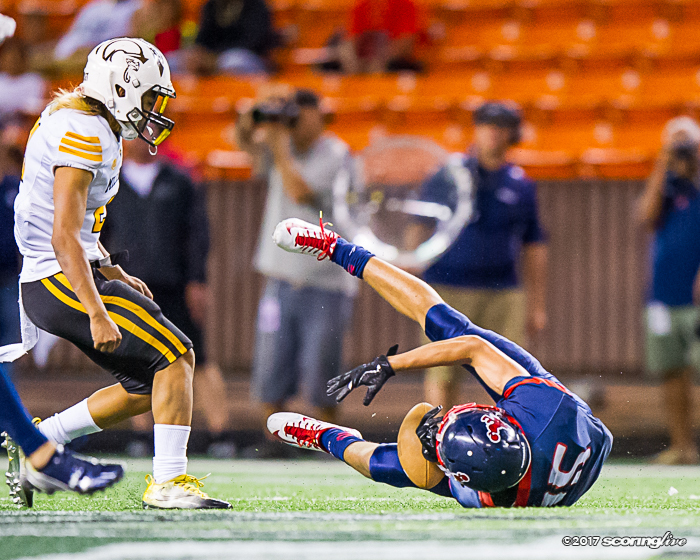 Pick it up.' 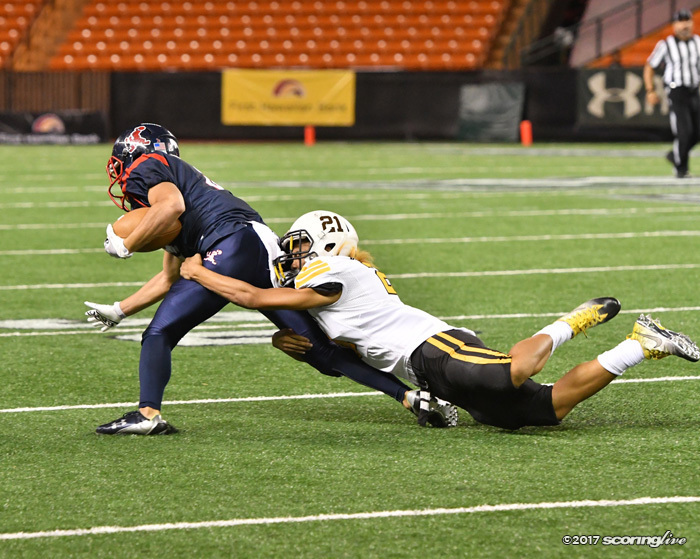 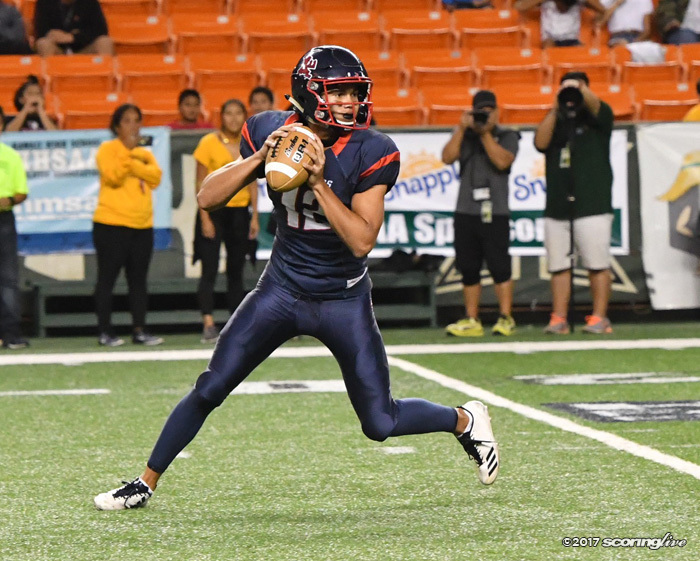 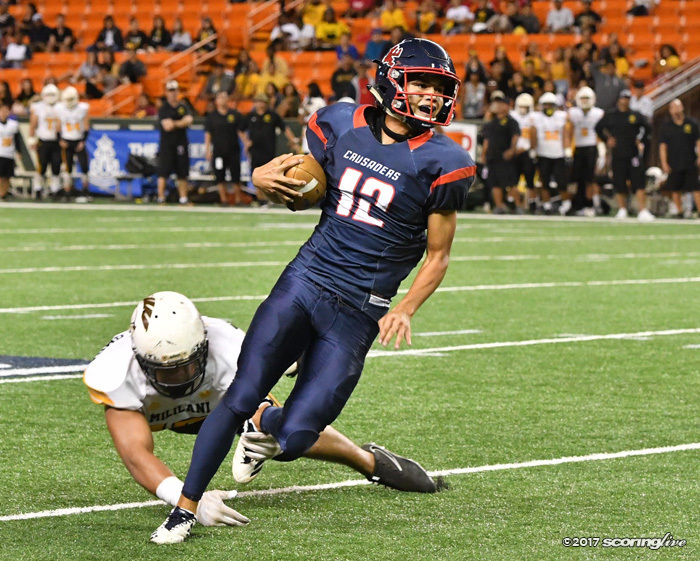 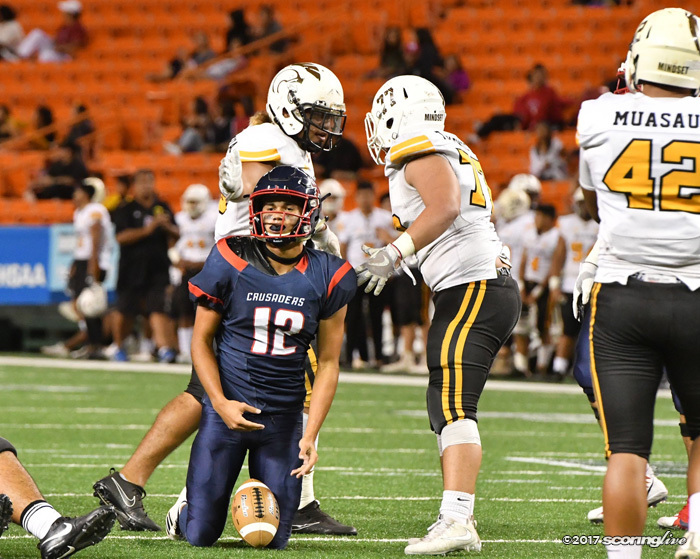 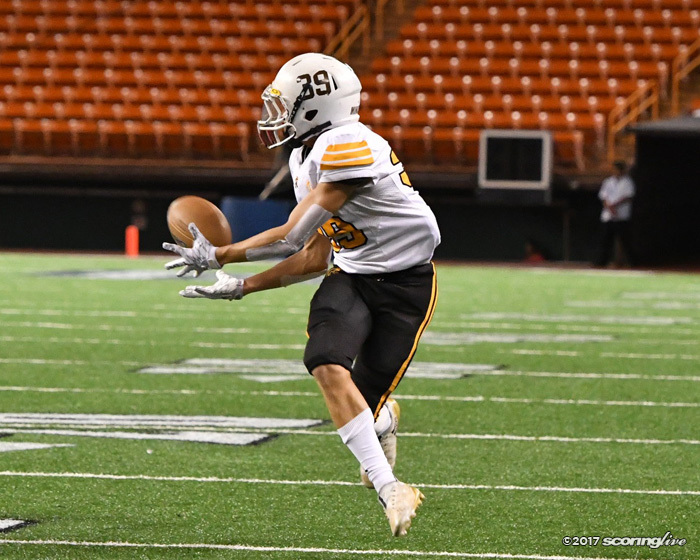 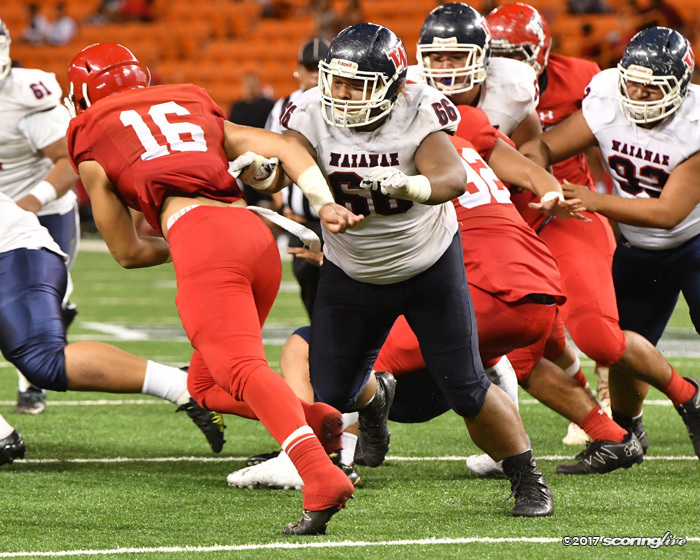 "
The final play of the first half saw the Crusaders go for it on third-and-goal from the Mililani 1-yard line, but Cordeiro was stopped short of the goal line on an attempted quarterback sneak. 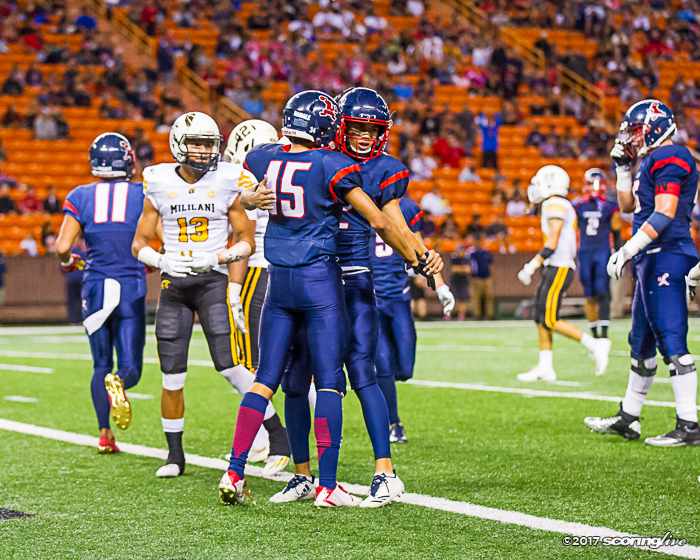 "That set a little fire in us," Quinn said. 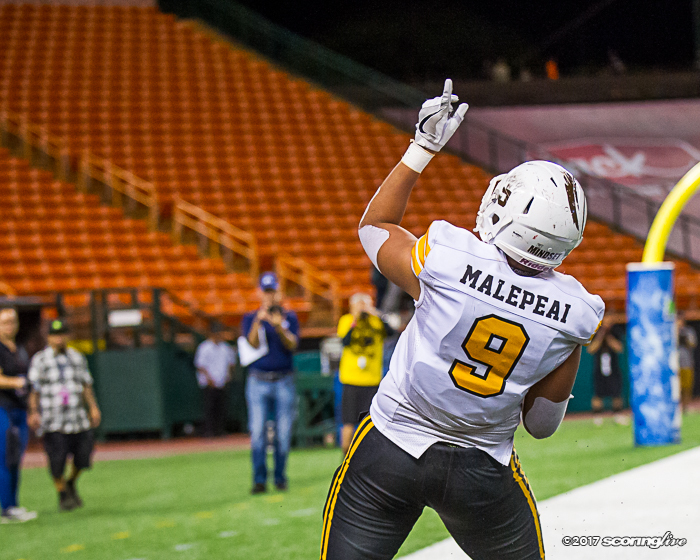 "Getting stopped like that isn't great, so we had to come out stronger and that just lit a fire in us." 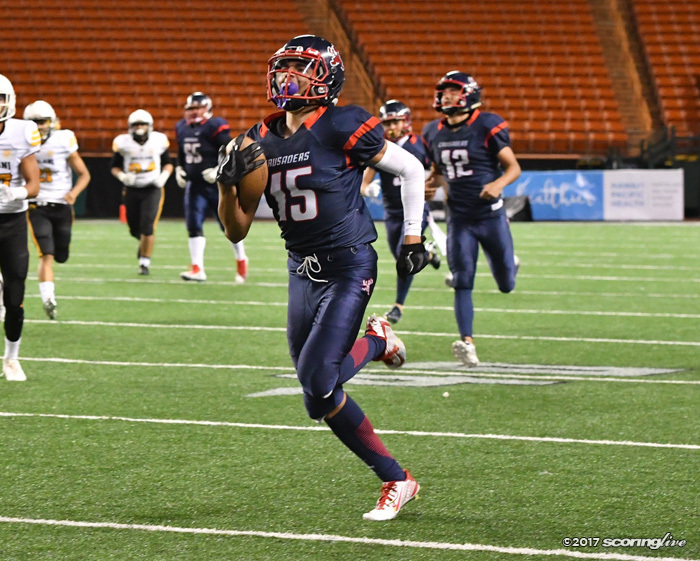 The Crusaders scored 27 points in the third quarter — all on Cordeiro-to-Quinn TD passes. 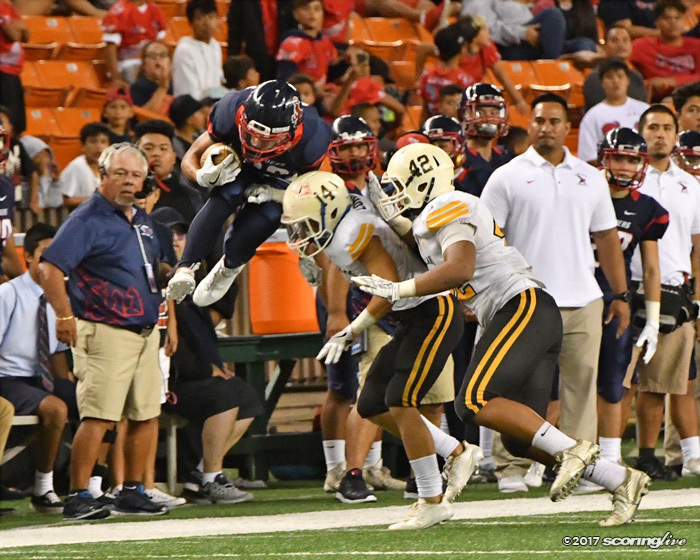 Quinn made the Trojans pay for missed tackles in the secondary and utilized downfield bloking from his teammates — as well as his speed. 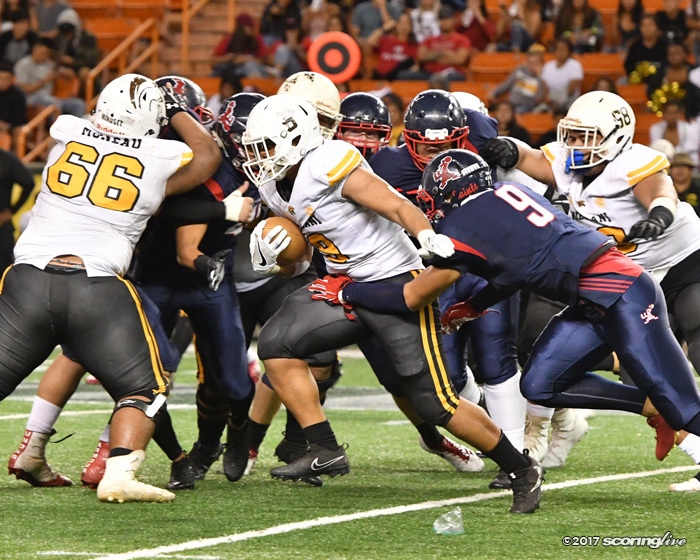 "My o-line is great. 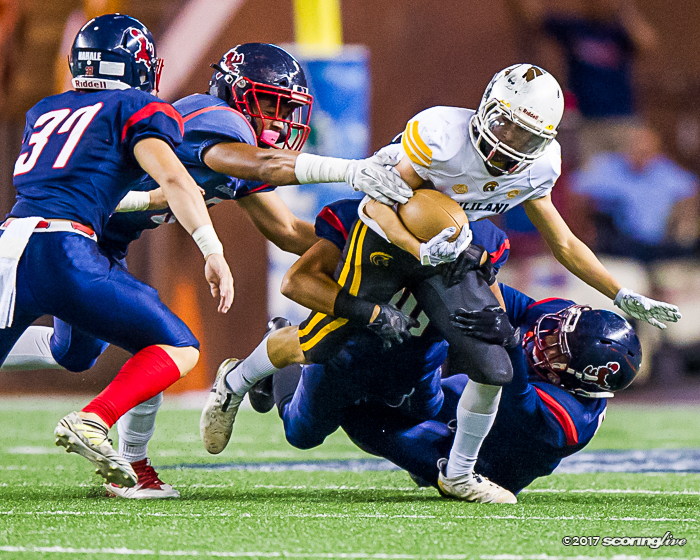 They're relentless, they don't stop until the whistle blows. 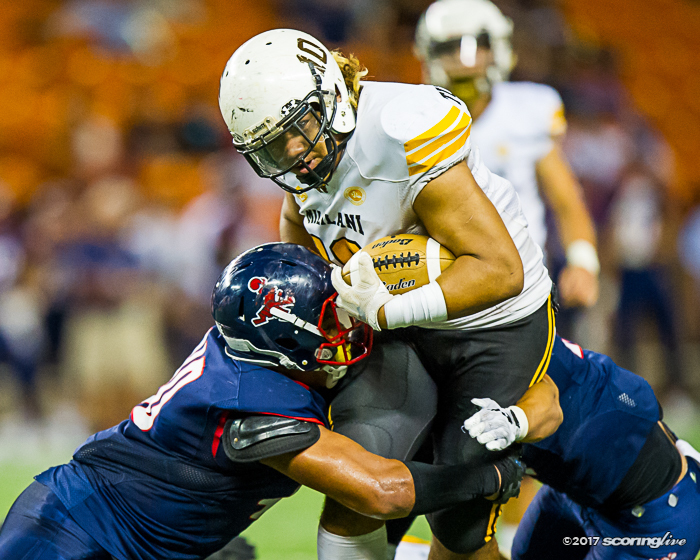 I love them," Quinn said. 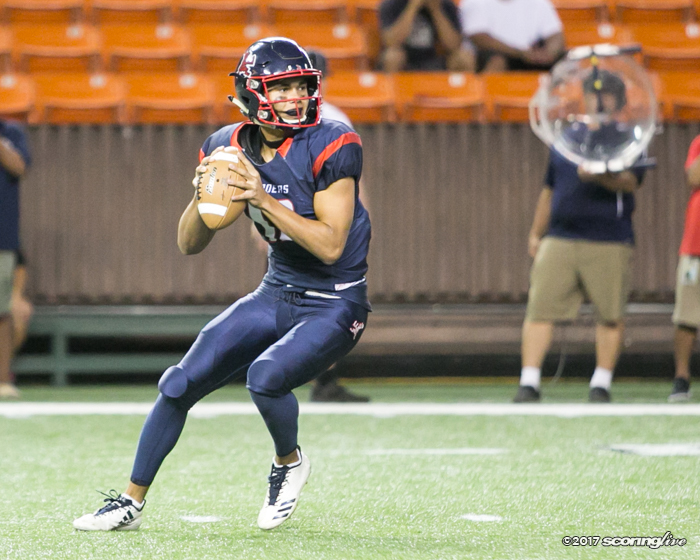 Saint Louis closed out the scoring with Jacob Tobias' 36-yard field goal with 3:01 remaining. 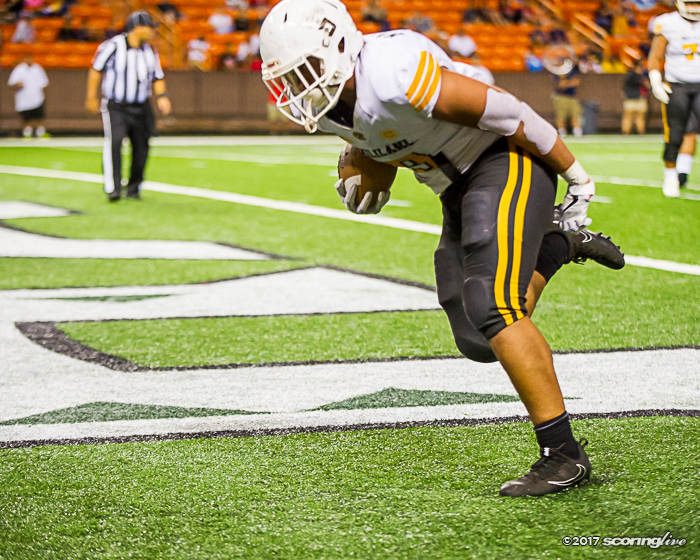 The Trojans jumped out to a 9-0 lead after the first quarter. 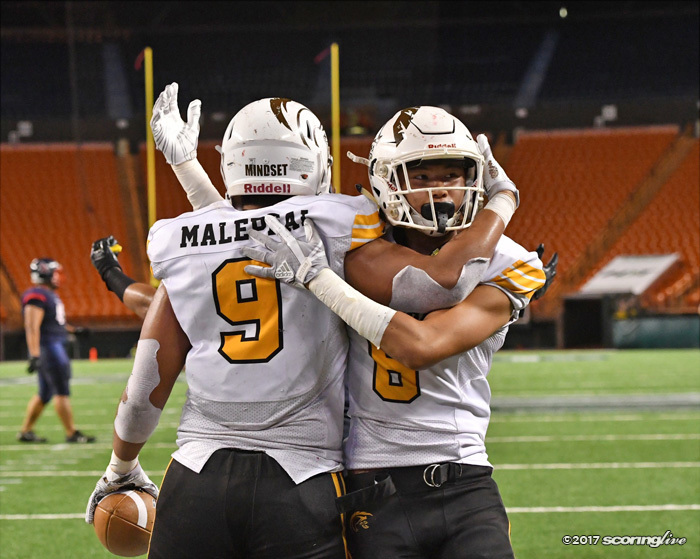 A holding penalty in the end zone on the Crusaders' second play from scrimmage gave Mililani a safety, and Gabriel found Kilifi Malepeai for a 5-yard TD pass later in the period. 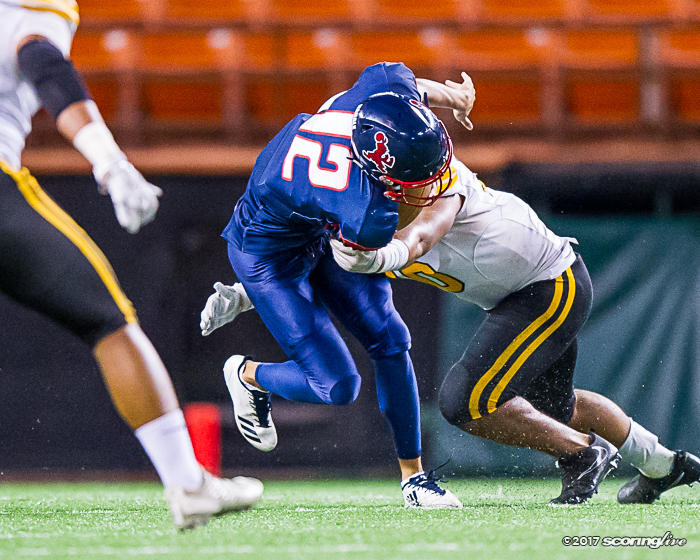 The same pair hooked up on a 12-yard scoring strike early in the second quarter. 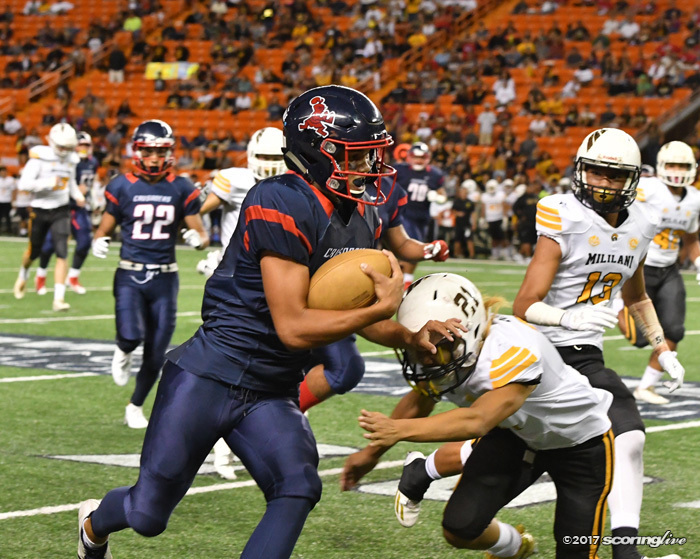 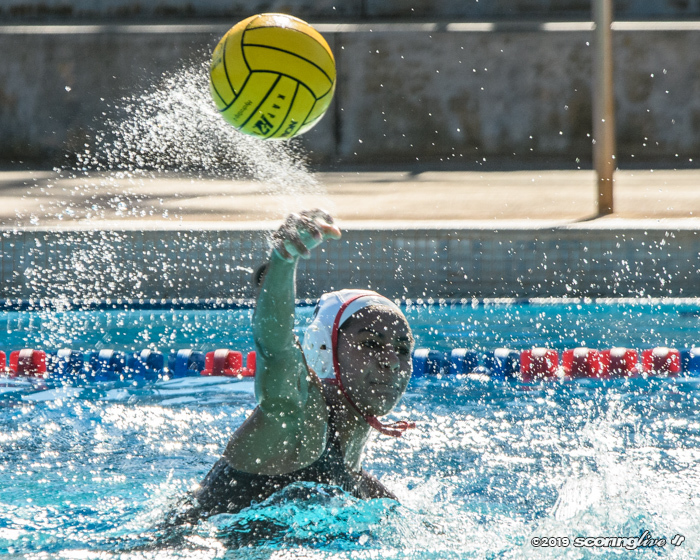 "We just forget about it, flushed it and then moved on," Cordeiro said of Saint Louis' slow start. 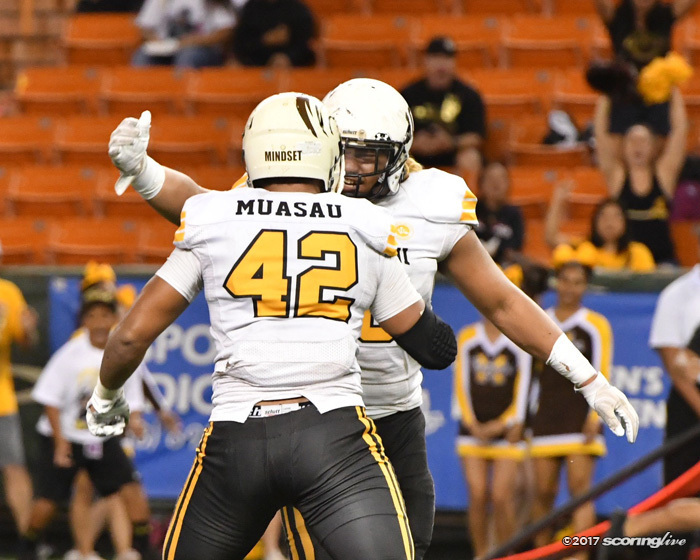 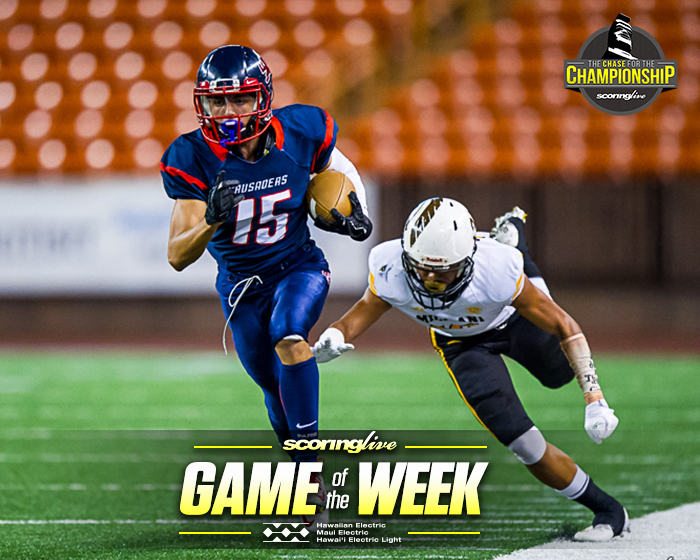 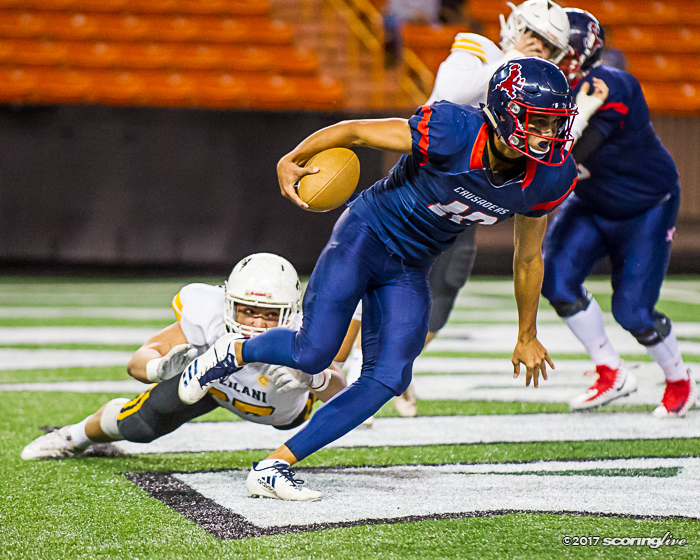 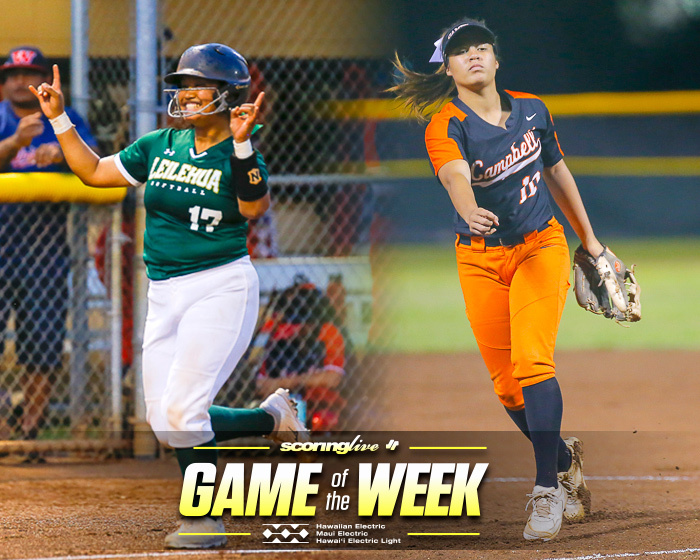 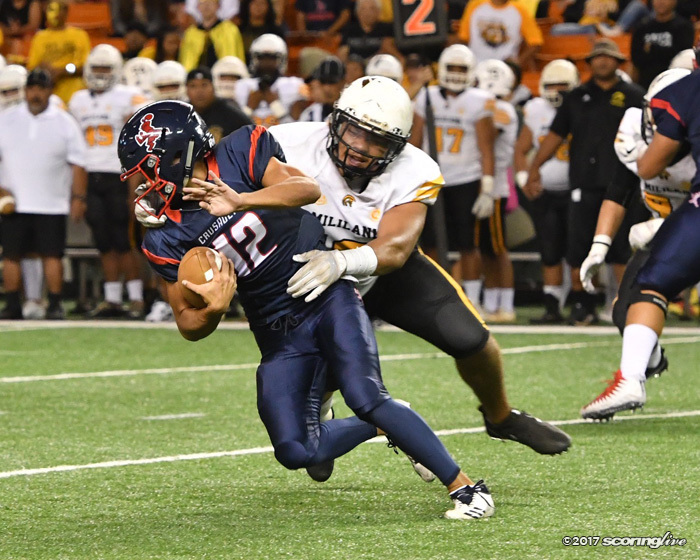 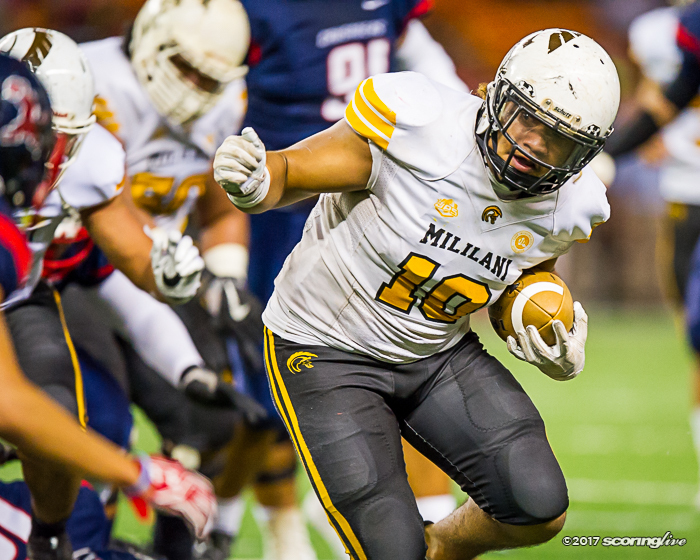 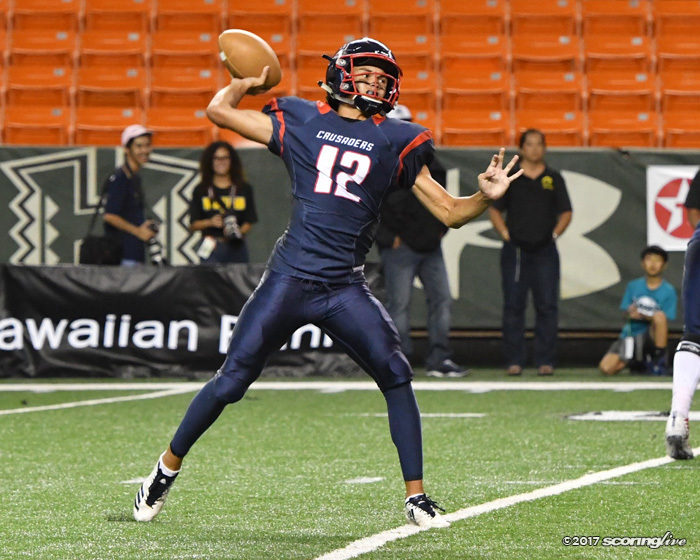 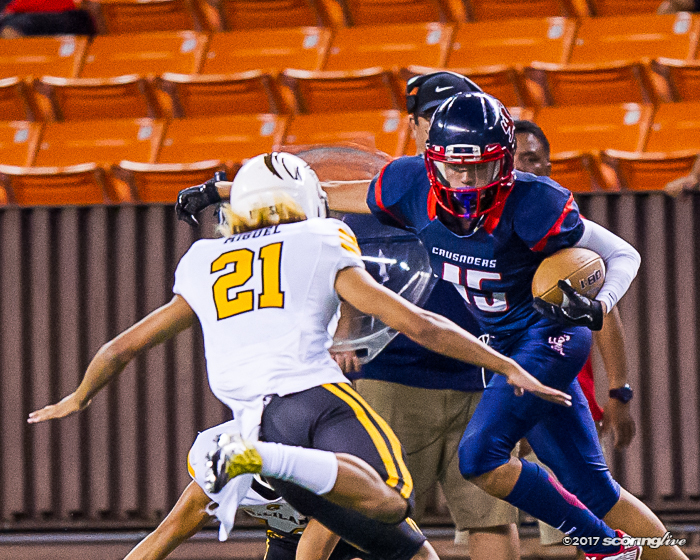 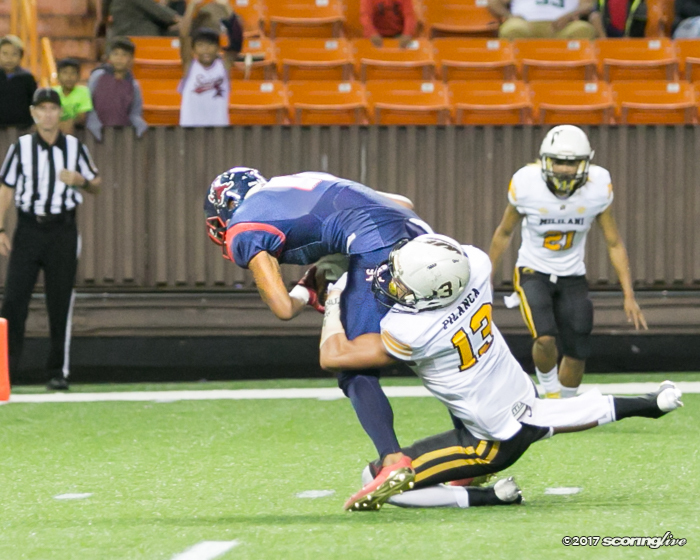 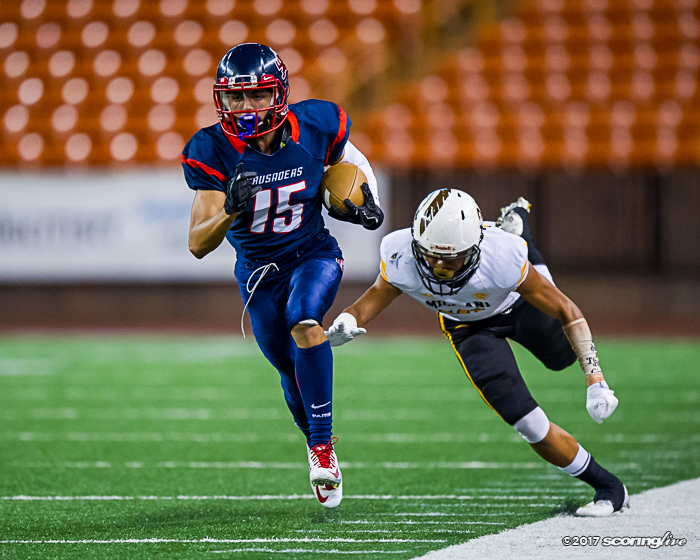 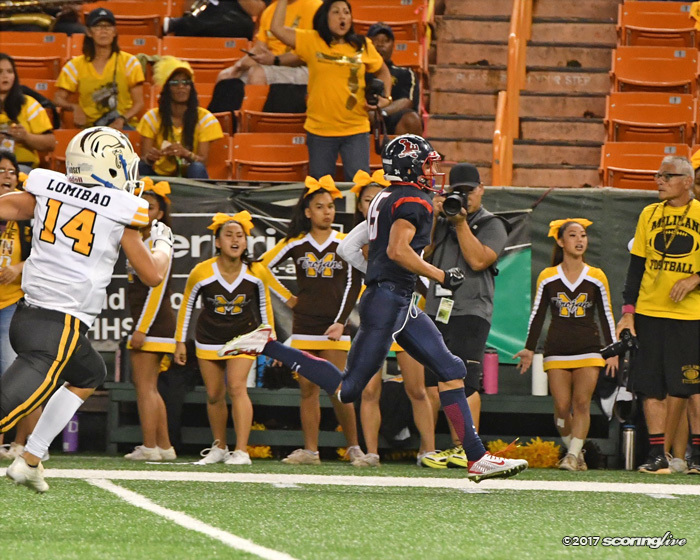 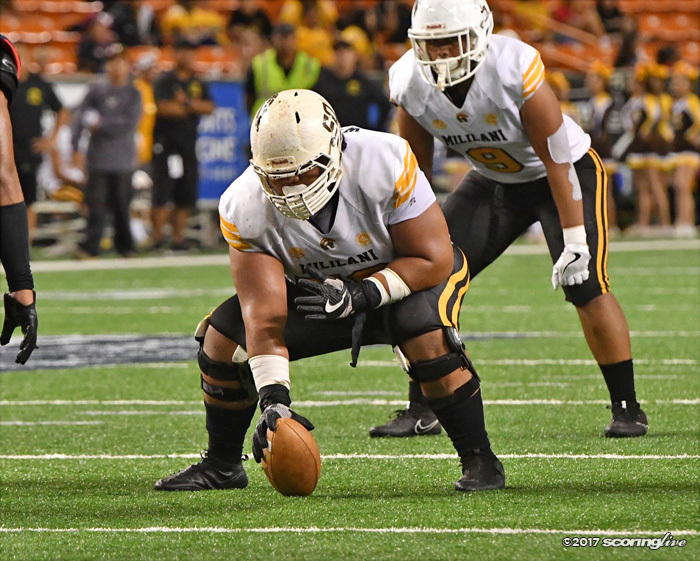 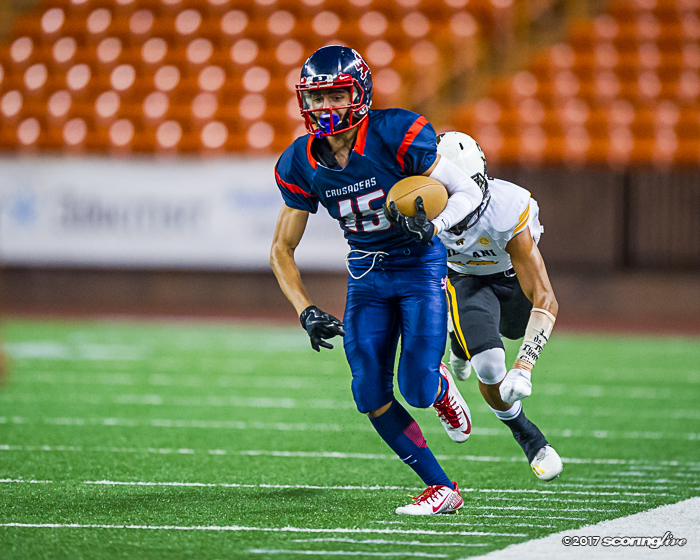 Mililani blitzed early and often, but Saint Louis had all the right answers. 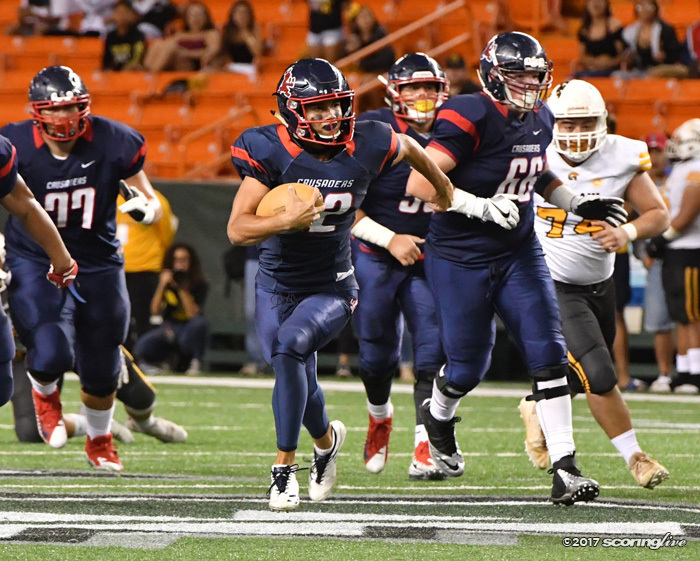 "We just ran hot routes with Mitchell and all the receivers — just short patterns," Cordeiro said. 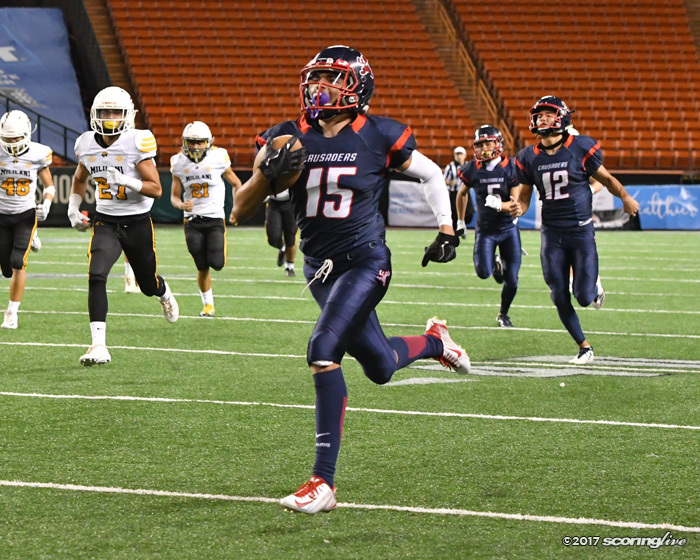 Quinn added: "We just didn't try to force things and just take the passes that were open, like the underneath routes." 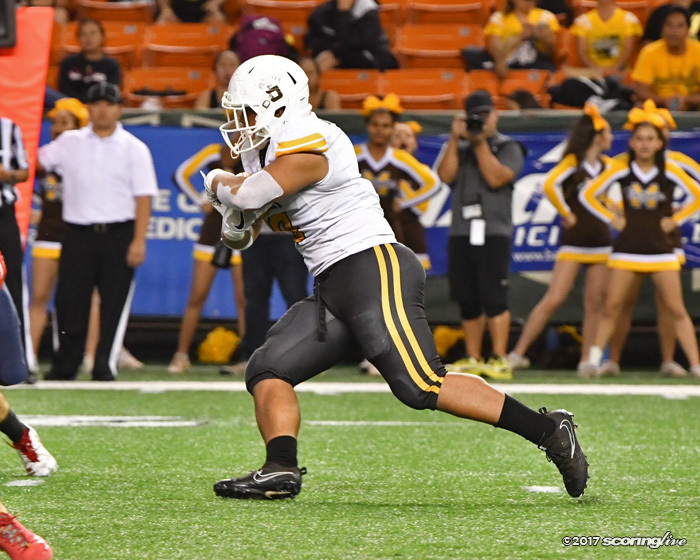 Cordeiro used his legs to extend plays and pick up big chunks of yards, including scrambles of 40 and 50 yards in the first half. 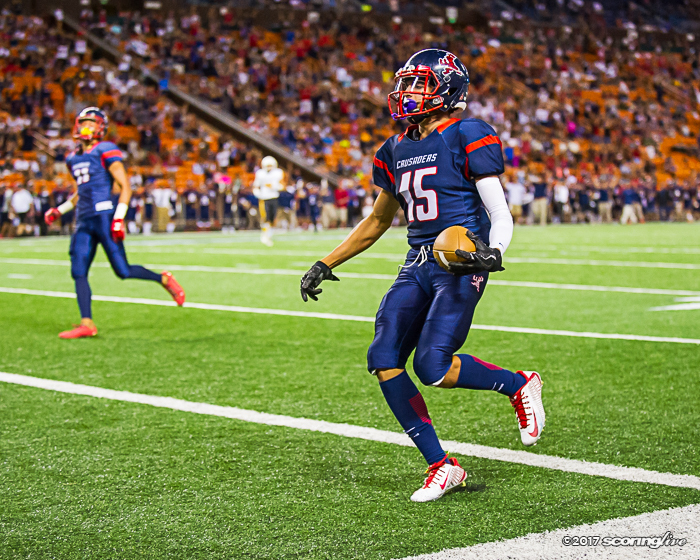 "I think that was the difference maker. 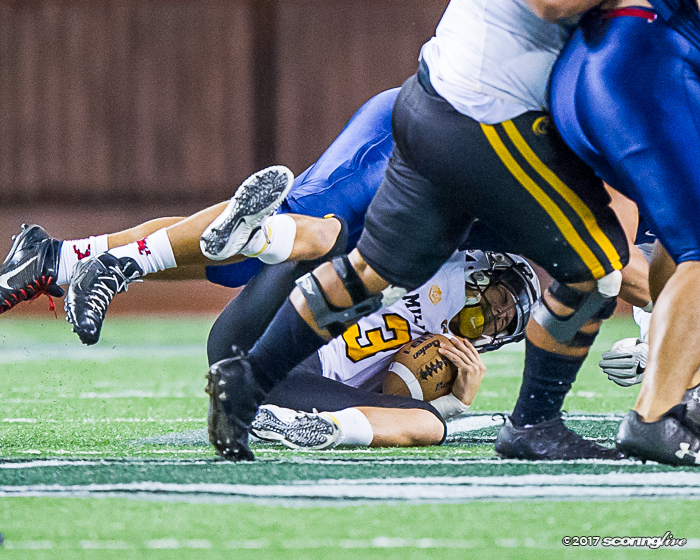 I mean, we had him and then he got out. 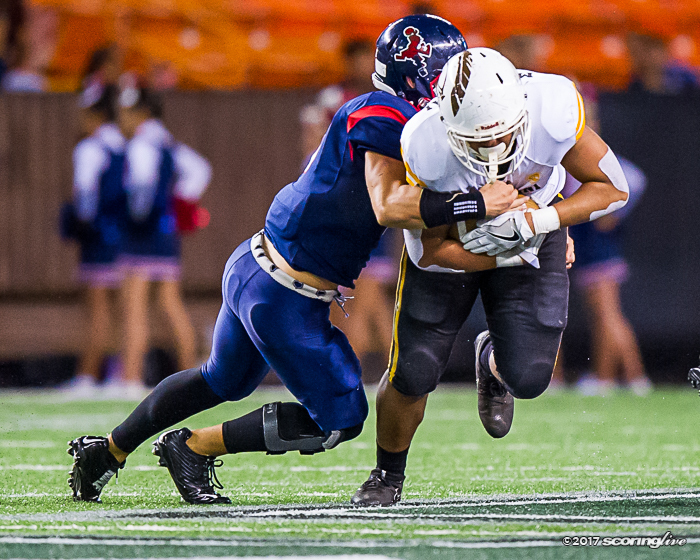 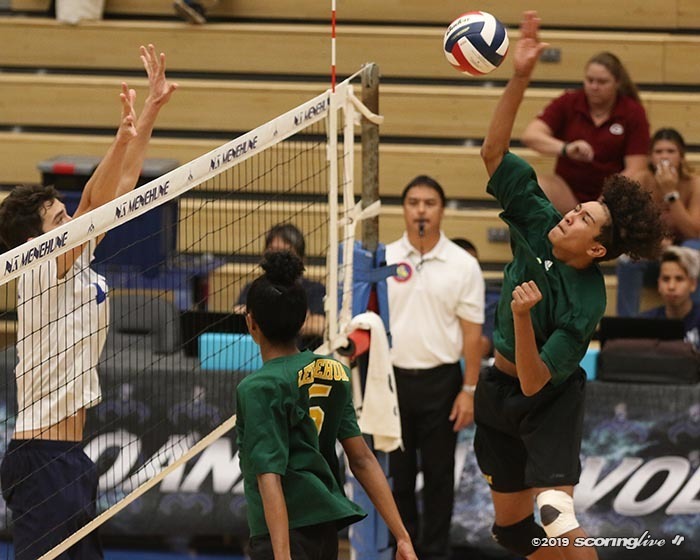 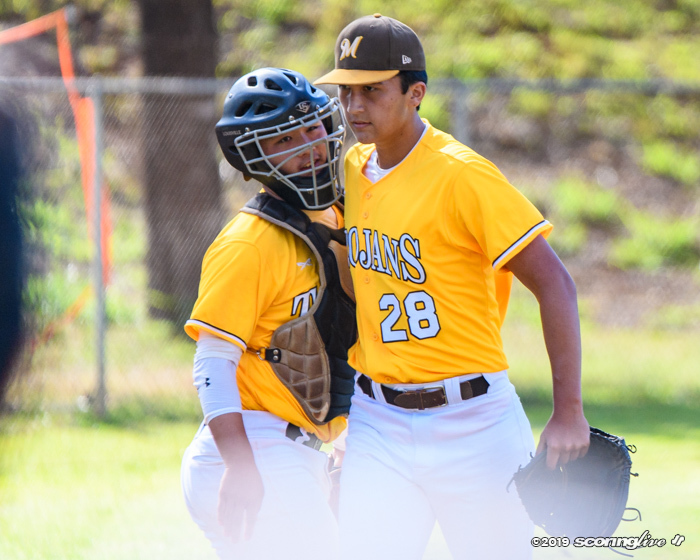 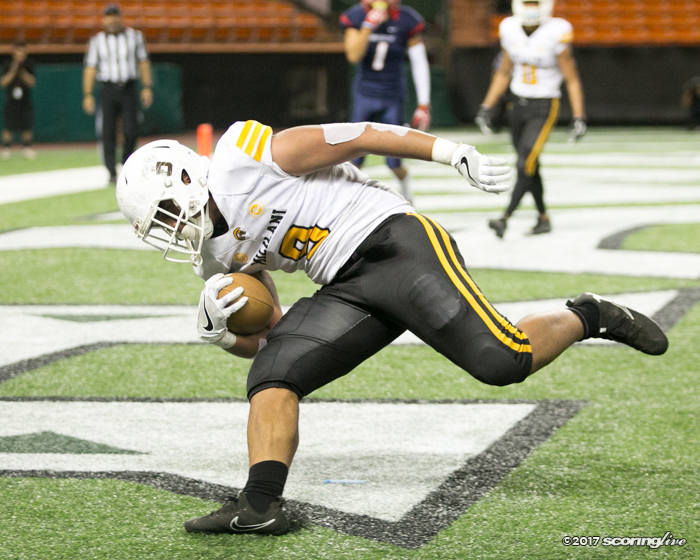 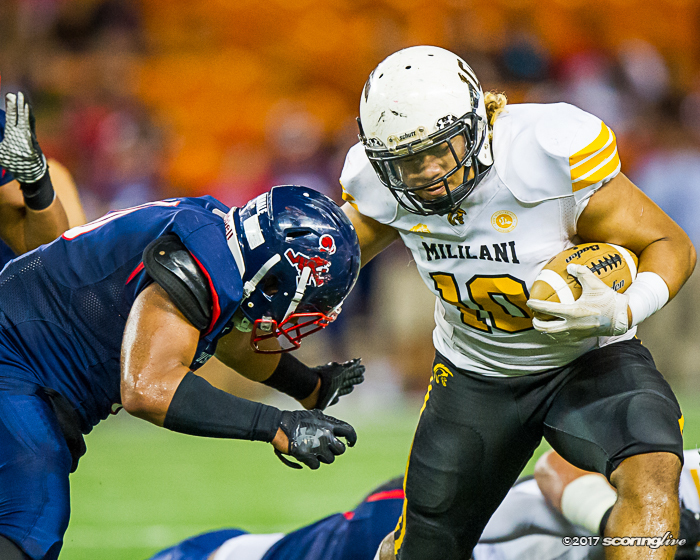 He's a hell of a scrambler," Mililani coach Rod York said. 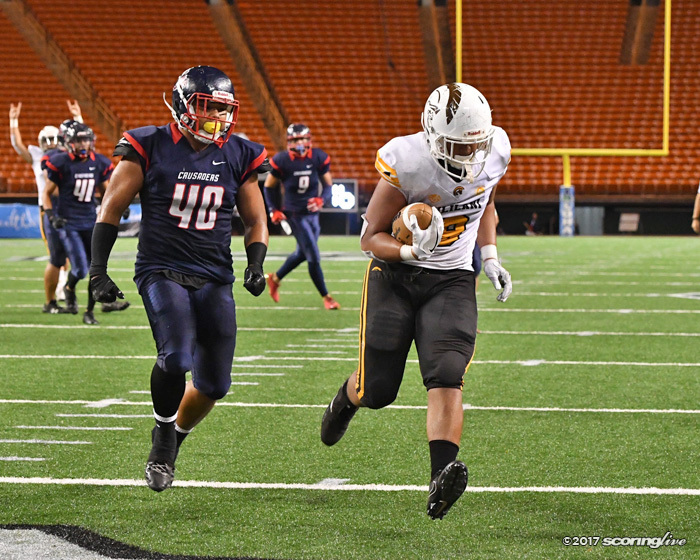 "We watched it on tape — he's done it all year — we felt like we could get him, but credit his feet. 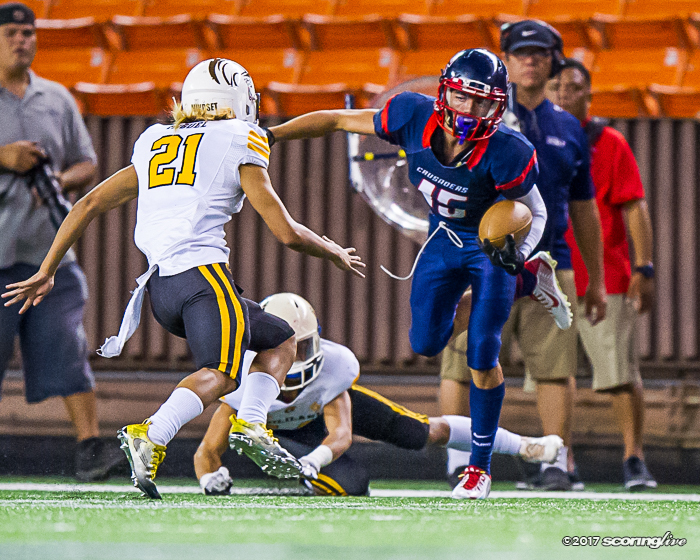 He can move and the other thing was he found guys downfield when he needed to." 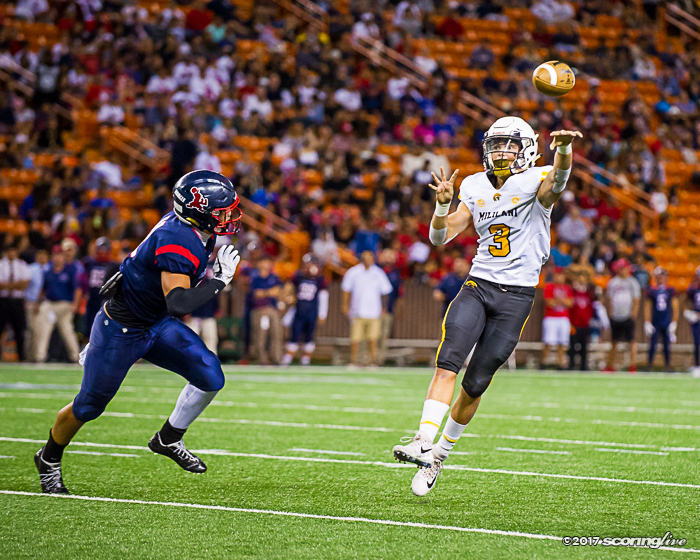 Gabriel finished with 252 passing yards on 23-of-51 passing with three TDs and one interception. 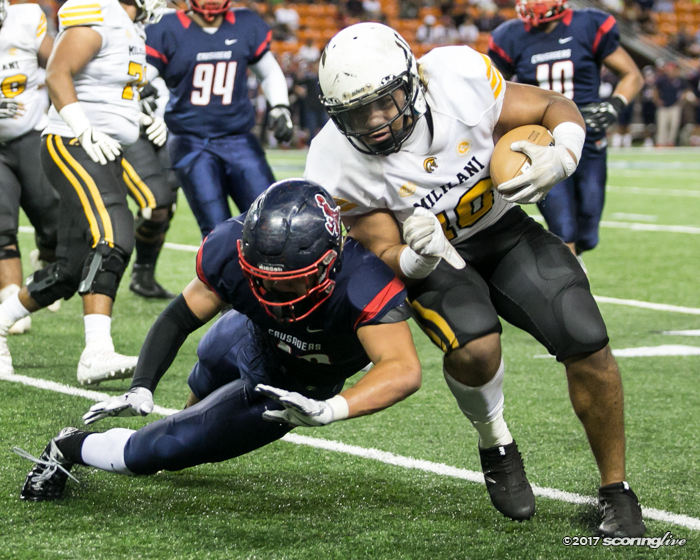 He also rushed for a team-high 66 yards on 12 carries despite being sacked three times for minus-28 yards. 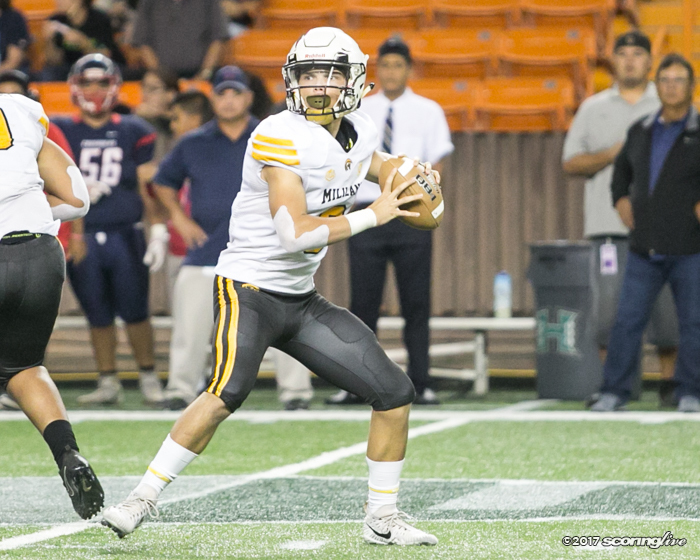 Cordeiro broke the previous state-tournament record of 478 passing yards by Leilehua's Kenan Sadanaga in a quarterfinal game against Baldwin in 2010.